Truro Junior Badminton Club is run by volunteers, who give their time freely and without reward. The coach is Tony Poole and he is assisted by Sue Biscoe from the senior club. Tony has been involved with the club since 1991 and took a hand in helping with the junior section right from the start. Having been a player since 1979, he has always been keen to share his experience and love of the sport, so it was a natural progression for him to take his first coaching badge in 1995. He is a Badminton England Level 2 coach and has participated in many coaching activities. 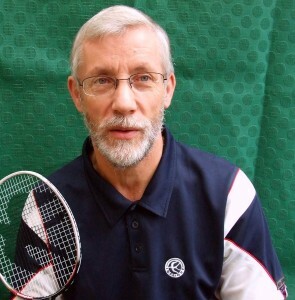 He was instrumental in the foundation of Cornwall Youth Badminton; he has assisted at regional centres of excellence; he is the adult-education badminton tutor at Truro College and has attended World Coaching Conferences on several occasions. Badminton still takes up a large portion of his retirement years! Sue is a regular helper on club nights and brings a wealth of experience as player and administrator within our sport. She plays regularly in our club teams and in the county senior teams. In addition, she serves on the county badminton association committee as a county selector and fixtures secretary, all of which keeps her very busy indeed. This means that she is occasionally not available to help on club nights and she is much missed when this happens! Last season we had to say goodbye to Duncan, who had been helping as often as he could, when he left the club to commence his time at university. However, that gap has been very ably filled by the return to club of Chris Cordell, a gifted player who started his badminton career at Truro Junior Badminton Club when he was just a boy of 10 years. Chris was a talented player who was good enough to be a member of the Cornwall Youth Badminton squads for several years. As one of those super-keen young players, he would also often assist Tony on some of his external coaching activities. When he left school, we lost touch with him for some years while he pursued his other passion of playing rugby. Now he has seen the light and realised tha badminton is a much safer and less bruising way to enjoy sport! He has lost none of his passion and skill and was very quickly drafted into the senior club’s teams. Chris has a very busy working life but comes to help out as often as he can, and we are very glad to have him back with us.